Thank you guys so much for being so awesome. I made myself stay up tonight so I could get this done and out there. 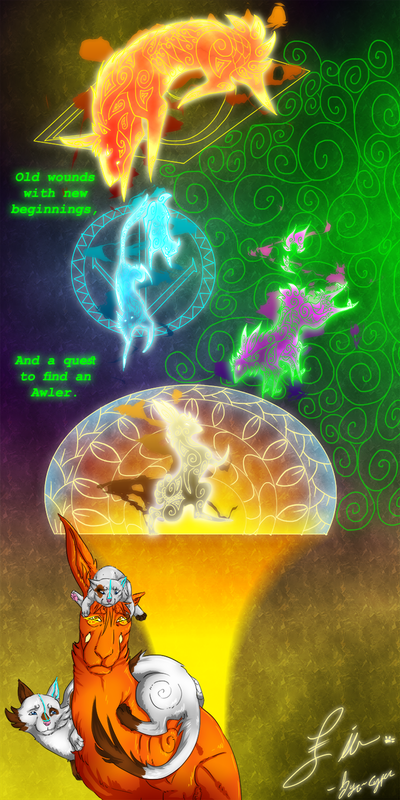 This page has been a hard one for me to make, both in the technical aspect of things and the emotional one. Y'see, this is cest fini for Mun and Goon. Their stories have concluded! Now, before you think it, this is not the end! Rather, it's the beginning of something new! What this means is, a new story within this world will be taking place. Don't worry! Mun and Goon aren't gone for good, the world is just getting a little bigger...or maybe a lot bigger. XD So, for the next few weeks or so, I'm going to be creating a buffer for my new pages and the new adventure yet to come! I'll still upload sketches and designs on Patreon so if you want to support me there, you'll have access to: The extra sketches/WIP's, unshared characters, designs both finished and in the works, and slides of my animations for my trailers both finished and unfinished. If you're interested in checking it out you can go here: Patreon. HUGE thank you for your support as my amazing readers, too! I would be a grand total of nowhere without you guys. You have no idea how helpful and uplifting you all are and I can't say thank you enough! I hope that your oncoming week is fantastic, and most certainly wish you the best.